Leanin’ Tree Installs a Kluge EHD to Increase Output, Flexibility and Dependability! 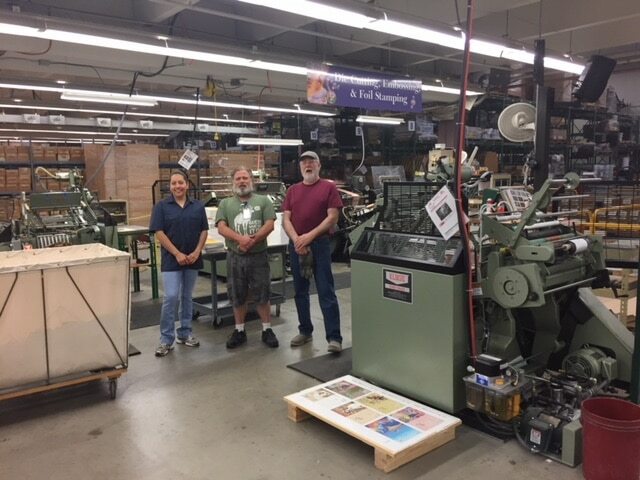 Leanin Tree, ‘America’s Favorite Greeting Cards’, has recently installed a Kluge EHD Foil Stamping, Embossing and Die Cutting Platen Press. The press was fully re-manufactured at the Kluge facility in St Croix Falls, Wisconsin and delivered with Kluge’s TRU-TON™ Adjustable Impression System. TRU-TON reduces or eliminates the use of packing material in make-ready and is operated with a simple single point adjustment control. Designed to accommodate sheets up to 17″x 24.75″ with up to 40 square inches of die area, the Kluge EHD is known for providing years of reliable service and is well established within the industry as the standard by which all presses in its class are measured. Leanin’ Tree was established in 1949, when Ed Trumble, founder and Chairman, started selling Christmas cards through the mail to western farmers and ranchers. Ed started with four Christmas card designs on a shoe string budget and shipped cards in shoe boxes. Today Leanin’ Tree employs over 200 employees, offers over 3,000 unique all occasion cards and ships over 20 million cards a year all over the world. The mission of this family owned company is “To bring the best in art and words together in a way that touches your heart.” This simple mission is accomplished with a lot of hard, yet fun work. Leanin’ Tree Greeting Cards has seen a lot of changes over the 69 years that they have been producing greeting cards. A big change has been all the embellishments they have added to their product line. Those embellishments include Foil Stamping, Die Cutting, Glitter, Thermography, Spot Varnish, UV Coating and Embossing. All treatments that are now very common for Leanin’ Tree and greeting cards.